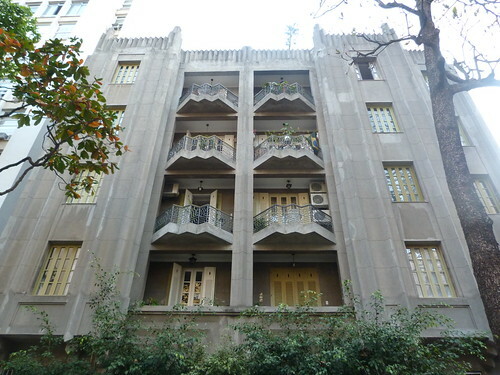 This is Edificio Guahy, designed by Ricardo Buffa in 1932. This magnificent apartment building barely escaped demolition in 1995 but thankfully the new owners were not granted a permit and the building has now been restored. The main features of the building are crystalline forms of the façade. 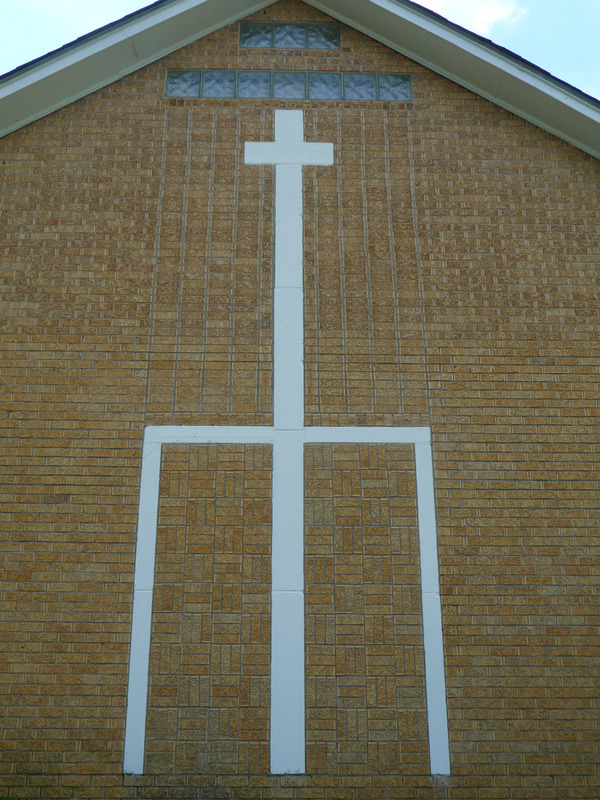 They can clearly be seen below the second storey windows and at the roof line. 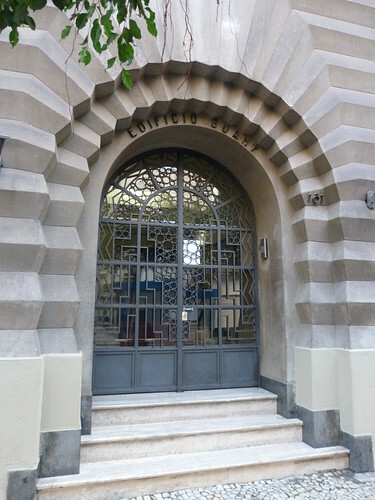 The stripes along the façade at street level extend from this amazing doorway. 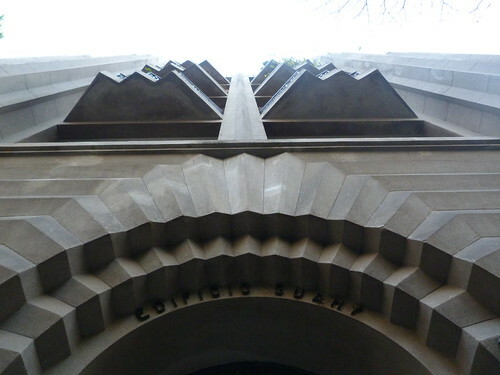 The open section at the centre of the building feature lovely pointed balconies with matching, angled metalwork. 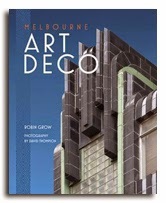 One of the problems of going to a World Congress on Art Deco is the difficulty to get clean photos of the buildings. There are so many other people wanting to have a look or take pictures that you have to be very patient to get that clear shot. Sometimes you end up with people in your photo. That's me! Right in the middle of the doorway blocking my friend Peter Sheridan's shot. Still he was nice enough to sent it to me and it does serve as proof that I was there. Photos of me a very rare. And I think it was worth me blocking Peter's shot because shortly afterwards, this is what I ended up with. Nice. Own your own or rented? How much? Wonder what it is like inside? Can Aussies move to Rio? In this particular case I don't know but I saw signs for both rental and purchase in other apartment buildings. Cost and interior is anyone's guess. I don't know about a permanent move to Rio but Aussies can get a 6 month tourist visa. 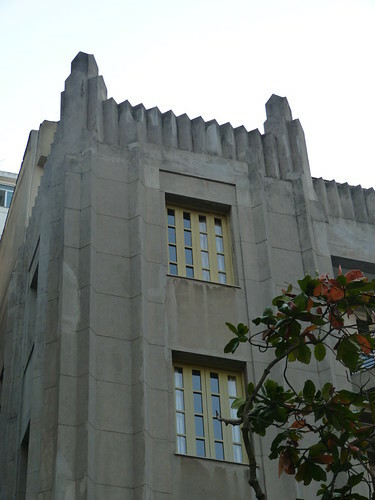 Tenho acompanhado o blog, e vejo as belas construções Art Deco que você vem publicando sobre o Brasil. Através de suas publicações, vou conhecendo também. 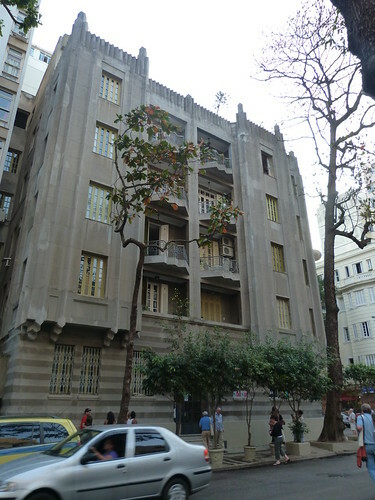 Foi bem ir ao Brasil ver as belas construções Art Deco e agora eu conhecei o pais e os brasileiros uma pouco melhor. 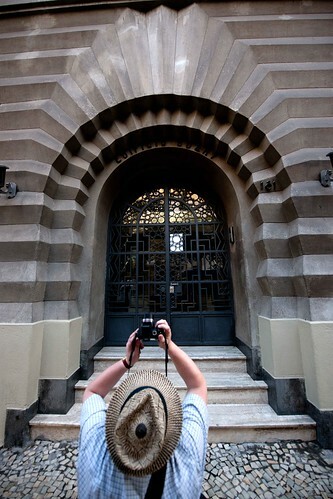 A very interesting photo essay on some of the diversity of Prague architecture.